Our retail barn offers many goodies – already picked apples and pumpkins, winter squash and gourds. 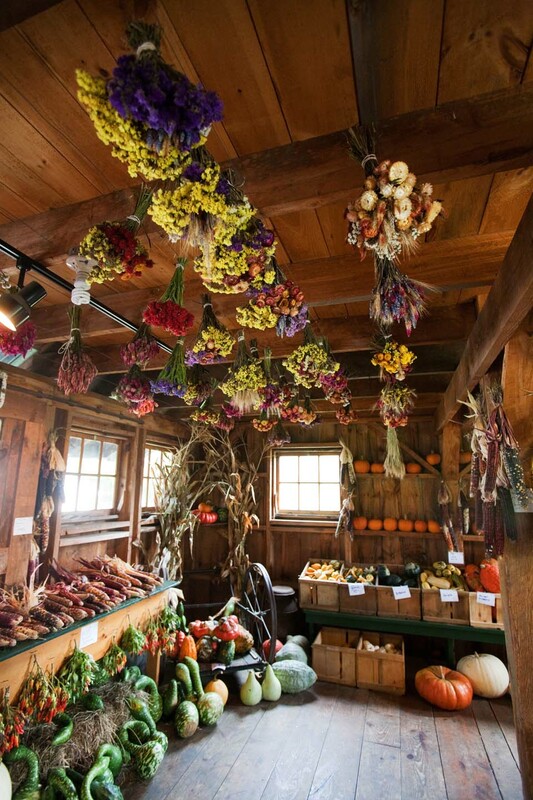 Dried flowers grace our barn ceiling and ornamental corn hangs from the beams. You can also find a selection of jams all made here, local honey, maple syrup and cheese from Taylor Brothers and smoked cheese by Garfield’s Smokehouse. The Barn Store is the hub of Riverview Farm. Stop in to see what apple varieties we are picking, grab a doughnut and cup of hot mulled cider or catch one of the hayrides up to the orchards. We have a full selection of jams made in our farmhouse kitchen including Apple Butter (one of our favorites). We carry locally made maple syrup, honey and cheese as well as our freshly pressed apple cider. During the weekend our horse-drawn wagon rides depart every 15 minutes or so and bring guests up to the orchard. It is a lovely way to see the farm and a nice way to carry all of your apples back down to the barn! The horses give rides from 11am-4pm, weather permitting. This year we are also offering antique tractor rides with Paul's father's John Deer H! Walk onto the wagon and listen to the put-put as you head off to the orchards. Step out the back of the barn and you will find our deck overlooking the Connecticut River and a lawn filled with picnic tables perfect for a packed lunch!